The NBA playoffs tip off this weekend, and it feels a little weird. No LeBron (!). The Milwaukee Bucks (!!) were the best team in the regular season. And for the first time in a long time, it’s not a forgone conclusion that the two preseason favorites (Golden State and Boston) will meet in the NBA Finals (!!!). According to Five Thirty Eight, the most likely NBA Finals matchup is Golden State vs. Toronto. The Warriors have a 61 percent chance to win it all. Could this be the last rodeo for the Warriors? Golden State has spent too much time fighting amongst themselves, fighting with the referees and fighting with the media. Kevin Durant’s looming free agency appears to be at the heart of this friction. Durant has known nothing but winning championships since joining the Warriors in 2016, winning two NBA Finals MVP’s. Why would anyone want to leave that? If the rumors are to be believed, Durant may bolt for the New York Knicks. That said, the Warriors’ lineup (Steph Curry, Klay Thompson, Kevin Durant, Draymond Green and DeMarcus Cousins) might be the most terrifying lineup ever assembled. The Warriors were the best offensive team in the NBA. And as Cousins gets healthier, Golden State might not be challenged until the Western Conference Finals. Can the Celtics get their act together? The Boston team that played most of last season without an injured Gordon Hayward and Kyrie Irving won 55 games and finished the regular season as the No. 2 seed in the East. The Boston team WITH Hayward and Irving this year won 49 games and is the No. 4 seed. The Celtics might be the most disappointing and confusing bunch in the league. How can a team add two All-Star players and get worse? Coach Brad Stevens built his career on overachieving at Butler and with the Celtics. This year, Stevens has faced substantial criticism for the first time. For Boston to reach the Eastern Conference Finals for the third straight season, they will have to get by Indiana and probably Milwaukee. Then if they get past those two teams, they will likely have to play Toronto. That’s about as tough of a postseason stretch as anybody will face. The key factor will be Hayward, who is still trying to regain his form before that devastating leg injury. This season has been Hayward’s worst since his second season in the league but he recently said he is feeling “more explosive.” Over the past five games, he is averaging 17.4 points, 5.6 rebounds while shooting 64.4 percent. Boston has also had to deal with Irving’s free agency and the speculation that he will join Durant in New York. Is James Harden going to wear down again? James Harden is an unstoppable offensive weapon. He led the league in scoring (36.1 ppg) – the highest mark since 1986-87 when Michael Jordan averaged 37.1. Harden also led the NBA in win shares (15.2) and value over replacement player (9.9). But there is one advanced metric that must be of concern: Harden also topped the league in usage rate at a whopping 40.5. It’s the second highest usage rate in NBA history eclipsed only by Russell Westbrook’s 41.7, which was set in his MVP season of 2016-17. While that season was individually great for Westbrook, Oklahoma City lost 4-1 in the first round to Houston. Harden’s team is much better. However, his style of play is worrisome considering his number of minutes (36.8 per game – third most in the NBA). Harden dribbles so much and is responsible for running the entire offense that his game plays right into the hands of Golden State which can throw several bodies at Harden over the course of a seven game series. Last year, Houston might have beaten the Warriors if not for Chris Paul’s injury. This year, the Rockets need Paul healthy so he can take pressure off Harden. 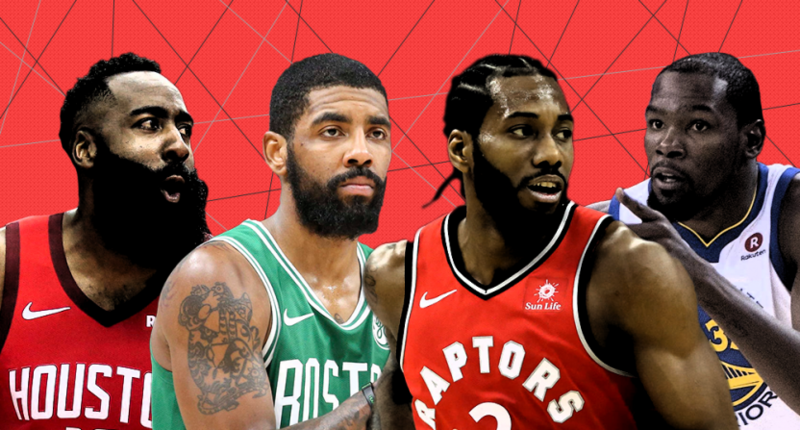 Can Toronto finally get to the NBA Finals? After years of being vanquished by LeBron, Toronto has legitimate hope. The Raptors made the most daring move of the offseason when they acquired Kawhi Leonard. Here’s when this is supposed to pay off. Curiously, during the regular season, the Leonard led Raptors weren’t statistically better than last year. But it’s all about the playoffs and the playoffs are another beast. Leonard has been great. He posted career highs in scoring (26.6 ppg) and rebounding (7.3 rpg). His player efficiency rating was the second of his career. Leonard also gives Toronto a defined go-to player with a league-high nine baskets to tie or take the lead in the final minute of the fourth quarter or overtime. As good as Leonard has been, another key acquisition could make the difference. Marc Gasol, formerly of Memphis, has been a substantial difference-maker. According to Ben Falk of Cleaning the Glass, when Gasol is in the lineup, the Raptors have been playing like the equivalent of a 73-win team. Gasol’s passing and defense gives Toronto an additional element. He knows how to get the ball to Leonard and Kyle Lowry. This is as good a shot as Toronto has ever had to finally get to the Finals. Do you trust either Milwaukee, Philadelphia or Denver? Milwaukee – Sorta – The Bucks were, by far, the NBA’s most dominant team. They won more games, had the best scoring differential (+9.1) and owned the best defensive rating. Giannis Antetokounmpo is the favorite to win the MVP. One major problem is that Milwaukee has given up the most three point field goals per game (12.9) and attempts (36.0) in the NBA. Philadelphia – Maybe – On paper, the Sixers’ starting lineup of Ben Simmons, J.J. Redick, Jimmy Butler, Tobias Harris and Joel Embiid is the only thing that comes close to the Warriors but that lineup has played together in only 10 games. Embiid’s lingering health issues are a concern. He has missed 14 games since the All-Star break with knee and back problems. Without Embiid, the Sixers will struggle to get past the second round. Denver – No – The Nuggets have been a great story after missing the playoffs for five straight seasons. They have the greatest passing big man we’ve ever seen in center Nikola Jokić (7.3 assists per game). But while Denver is great at home (+10.7 scoring margin – second only to the Bucks (+12.7)), they are vulnerable on the road (-2.6, third worst among playoff teams).